I'm in love! I've fallen for a beautiful lip smackin', thirst quenchin' mango sorbet! Ever since I caught sight of the sorbet, on Cynthia's Tastes Like Home, I knew it had my name on it. Tropical, sensual and luscious - I had to have it. The recipe had been within my grasp all along, I just hadn't realised. With sweaty palms and trembling fingers, I turned to page 108 of The Perfect Scoop. It smiled at me, I licked my lips.... it was mine. 1 tablespoon dark rum, plus more to taste. Peel the mangoes and cut the juicy flesh from the stones. Cut the flesh into chunks and put them in a blender, along with the sugar, water, lime juice, rum and the pinch of salt. Squeeze any remaining juice out of the mango and add it to the blender. Puree the mixture until smooth. Taste the mixture and add more lime juice, or rum, as required. Chill the mixture thoroughly before churning in your ice cream maker, according to the manufacturer’s instructions. 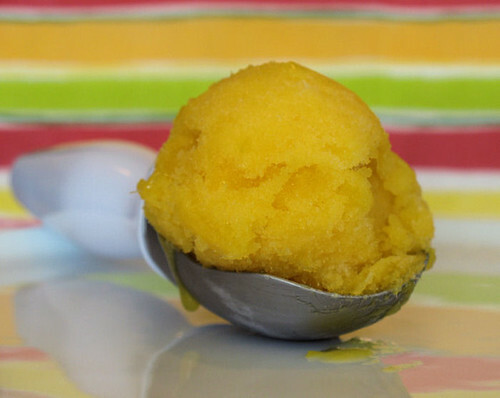 Put the sorbet into a freezer-proof container and pop into the freezer. It's a special edition in honour of Briana Brownlow - read about the fundraiser here. This looks so good and something I would also love (I love mangoes!!). I have The Perfect Scoop, great book! It looks wonderful, Nic - a great choice! words that spring to mind: refreshing. delicious. tart. must. have. now. looks, sounds, and is surely fabulous! Wow, Nic, that looks scrummy! And sooooo easy! Great photo. I have mangoes everyday and this recipe sounds delicious! This does look amazingly refreshing. The sorbet would have me doing the mango tango!! i'm not a big fan of the mango texture but in sorbet is delicious. naturally so sweet... great shot! Oh, I love mango's one of my favorite fruit. That mango sorbet looks so good! The sorbet looks great and your photo is awesome! I really love it! Looks lovely Nic - I love mangoes! The bright yellow sorbet reminds me of 'summer'. You have a winner Nic...stunning sorbet & stunning picture too. What a beautiful & refreshing entry for CLICK! you make me long for summer again, and winter has just started! LyB - I'll be expecting to see some ice cream recipes on your blog shortly, lol! Grace - I do hope you are talking about the sorbet, ha ha! Raquel - thank you so much! Nadia - hi there! Welcome and thanks! Valli - I wonder how the 'mango tango' goes? I'd love to see you do it!! Aran - I know what you mean about the texture, it's not noticable in an ice cream! Sue - it's very refreshing! Kevin - it was very nice! Sticky - thank you so much! Jan - thanks, I quite like them too! Arundathi - welcome and thanks! Jeanne - I really like pistachios ice cream too, thanks so much! Ann - it has the dribble factor! Passionate Beker - thank you my friend! Rose&Thorn, hello - welcome to my blog! Thanks so much for your comments! thanks for dropping by... love your blog and love the yellow! I love your tango with mango:) I mean, great looking dessert! What a lovely color. the taste must be heavenly! For those of us who don't have ice cream makers, I propose using Heston Blumenthal's technique of using dry ice to freeze the ice cream (or, presumably sorbets). In a cooking contest a couple of weeks ago I made a caramelized onion ice cream (we had to use onions in every course!). In the 90 minutes we had to cook, you don't have time to caramelize the onions and freeze ice cream the conventional way. So here is a link to the page that had the contest. The last entry is the ice cream! The measures are all US, but they aren't very precise - no real need to be. Arundathi, Farida and Rosie - thanks! Chris - thanks so much for stopping by! I will definitely take a look at your interesting sounding onion ice cream. Over here (UK) dry ice is quite hard to come by (unless you are in the industry) and needs special handling. I wouldn't recommend it to the typical home cook unless they know what they are doing with it.